This “Elm-tree” was popularly known as the Treaty Elm, under which it was believed William Penn, founder of the Pennsylvania colony, made an agreement of peace with the Lenape Indians. 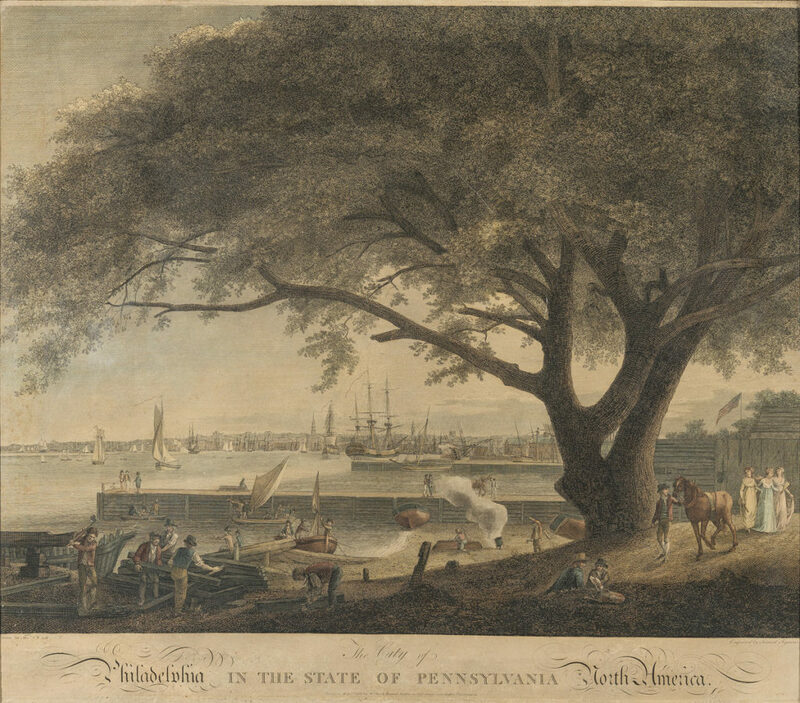 The tree served as an important symbol of Philadelphia’s founding narrative, which already had reached mythic proportions by the early nineteenth century. Many prints, including an 1801 hand-colored etching by Samuel Seymour after Thomas and William Russell Birch, depicted the tree as an ancient and revered resident of the port of Kensington, or Shackamaxon, a neighborhood north of Philadelphia. The Seymour and Birch etching presents a bustling scene of woodworking—specifically shipbuilding and repair—occurring directly beneath the elm’s limbs and thick foliage, visually linking the historic tree to its neighborhood and related industries and emphasizing the city’s rapid development over time. The great elm was widely mourned when it fell down in a storm on March 3, 1810. Newspapers from Vermont to South Carolina reported the ancient tree’s demise: “This celebrated tree, having stood the blast of more than a century since that memorable event, is at length prostrated to the dust!”¹ Following its fall, the elm’s wood was converted into various artifacts—including boxes, chairs, and portrait busts of William Penn–-that were disseminated throughout the nation and even across the Atlantic Ocean to England. For creators, collectors, and recipients of these Treaty Elm and other historic wood relics, an aspect of the object’s power resided in a perceived vital essence. By participating in an episode that was iconic in local, and even national, memory as symbolic of peace, virtue, and justice, the wood of the Treaty Elm became saturated, and therefore animated, with associated moral values and lessons. In 1813, Magraph displayed a pair of wooden vases made from the elm at the annual exhibition of the Columbian Society of Artists and the Pennsylvania Academy, each with the title, “A Vase, made from part of the tree under which William Penn formed his first treaty with the Indians—in 1682.”² Although Magraph was listed in the accompanying catalogue as an academician, he never exhibited any other objects at the academy’s annual exhibitions. For many years, the Winterthur urn was thought to be the sole survivor of this pair of carved vases, until I located its match in the Philadelphia History Museum (PHM) this past spring. Both vases feature prestigious provenances: the Penn Club, a historic, private gentlemen’s club in Philadelphia, donated its vase to the Historical Society of Pennsylvania in 1987, and it was subsequently transferred to PHM with the majority of the society’s art and artifacts collection. The Winterthur urn, purchased at auction, was reportedly the property of the architect Robert Mills, who was secretary of the Columbian Society of Artists when the vase was displayed in 1813. A comparison of these two vases allows us to better understand how Philadelphia area carvers like Magraph used Treaty Elm wood to advertise their services through commemorative objects. 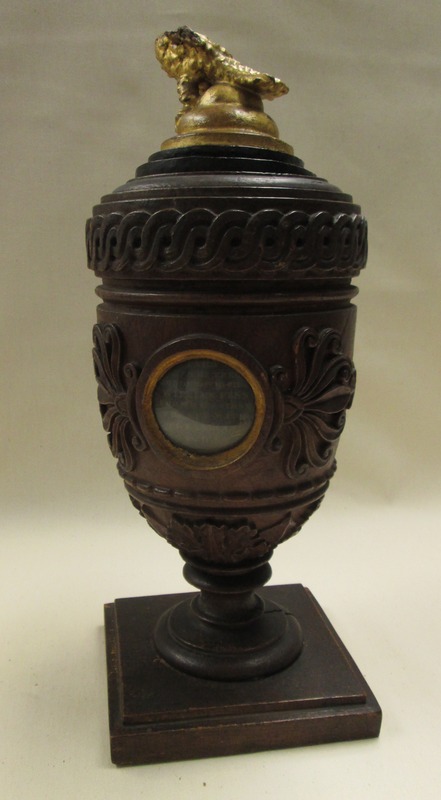 Maker unknown [George Magraph, attributed], “Urn made from the Treaty Elm,” 1813, wood, glass, 15 1/2 x 6 x 6 in., HSP.19871.1 Courtesy of the Philadelphia History Museum at the Atwater Kent, The Historical Society of Pennsylvania Collection. While they are similar in size and material, the Treaty Elm vases are very different in form and decoration. Several differences are likely the result of individual changes accumulated over time. The vases, for example, feature dissimilar bases added at a later date, and the PHM vase is the sole retainer of its original lid, ornamented with a carved and gilded eagle. Both vases include a relief portrait of William Penn, copied after a popular likeness circulated by Sylvanus Bevan, and explanatory text on the opposite side, either inscribed on a round brass plaque or framed behind glass. Carved acanthus leaves and double stars flank the Penn and text roundels on both vases. The inscription on the PHM vase diverges slightly from that of the Winterthur vase, quoted above, reading: “Part / of the Tree / Under Which / William Penn / Form’d his First / Treaty with / the Indians in 1682.” It is therefore possible that one of the text roundels is not original. While these disparities are likely all due to more recent interventions, Magraph was responsible for the noticeably different carvings that ornament the vases’ pedestals and upper rims. Both vases feature their own unique leaf-carved pedestals, and while the Winterthur vase displays a rigid, geometric carved pattern along its top rim, the PHM vase includes a design of interlocking, curvilinear lines. Magraph therefore used these vases to display the range of his carving ability to visitors of the 1813 annual exhibition. Through their diverse patterns and ornament, the pair of Treaty Elm vases simultaneously showcased their carver’s dexterity and memorialized the recent passing of the elm through an ornate homage of visual and material references to that tree and its associated event. They also make tangible the symbolic importance of the Treaty Elm to Philadelphia woodworkers and carvers, whom the elm shades in the previously discussed Seymour and Birch etching. According to piece of manuscript paper found inside the PHM vase, “the wood was bought at the time the tree was blown down by Marinus Willett Pike,” a carver and gilder who lived in Philadelphia’s North Ward according to the 1810 census. It is unclear if the author of the note attributed the vase itself to Pike, perhaps in collaboration with Margraph, or implied that Pike only purchased the wood. Either way, the reference to two Philadelphia carvers—Pike and Magraph—within the vases’ history illuminates how local craftsmen actively worked to create and preserve Treaty Elm relics. 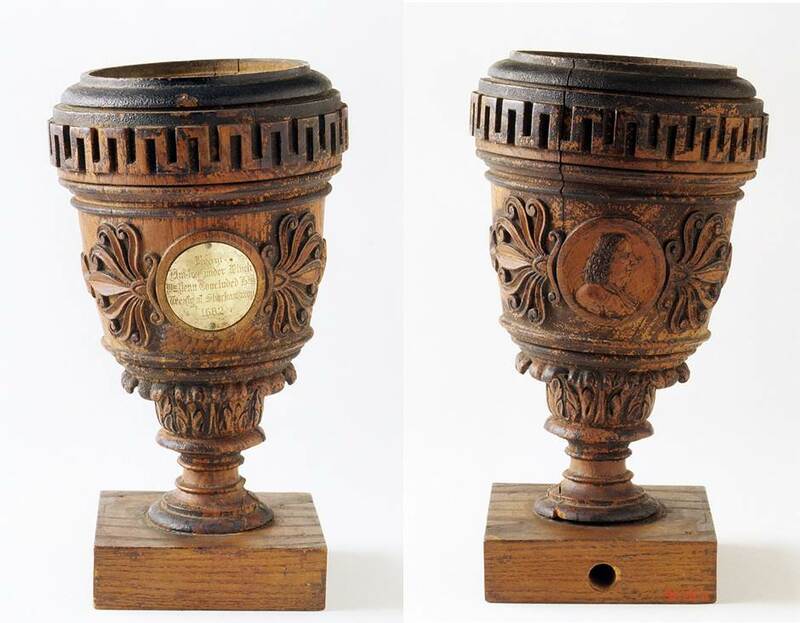 Reuniting the two Treaty Elm vases allows us to see how a carver used these objects to both advertise his skill in manipulating wood and commemorate the region’s Anglo-American history. ¹Poulson’s American Daily Advertiser, March 8, 1810; Vermont Courier, March 28, 1810; Charleston Courier, March 10, 1810; New-York Gazette, March 12, 1810; Independent American, Washington, D.C., March 24, 1810. ² Third Annual Exhibition of the Columbian Society of Artists and the Pennsylvania Academy (Philadelphia: T. & G. Palmer, 1813), 7. This blog was posted by Laura Turner Igoe, Winterthur NEH Research Fellow. 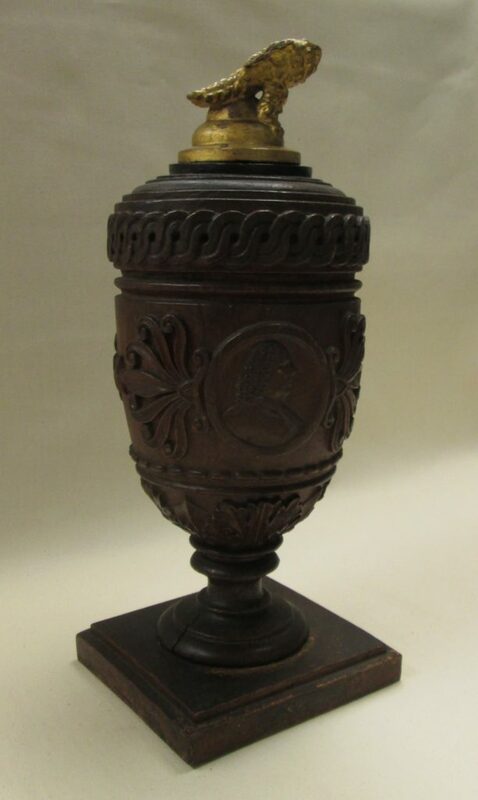 This entry was posted in Academic Programs, American Culture Studies, antiques, Decorative Arts, museum collection, Students & Alumni, Uncategorized and tagged antique urns, antique vases, decorative wodwork, native american, pennsylvania history, philadelphia history museum, Winterthur Museum. Bookmark the permalink.